The title gives us a clue to Rule’s approach. Poems go in search of paintings that are gone in search of place. 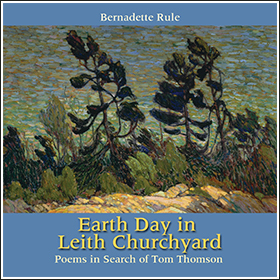 We see Thomson in these poems continually heading off, setting up, getting started. “I’ll waken … then strike out for the deserted / lumber camp near the river’s mouth.” Every poem a departure. But how do poems actually search? I think of someone lifting a mattress to look for a lost sock, rummaging through a jewelry box, or on a grander scale, leveling binoculars over untrodden mountains.